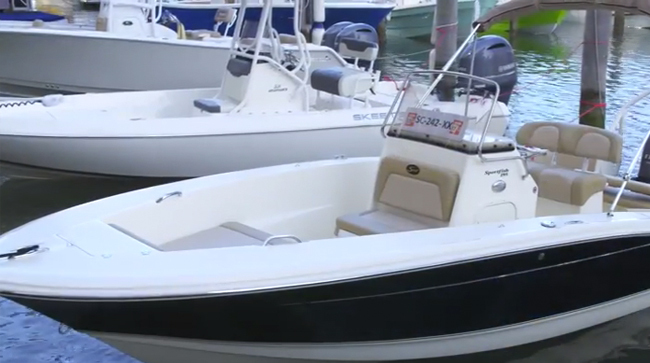 Many center console offshore fishing boats claim to be family friendly, but the new 320 LXF from Scout Boats makes good on the promise. 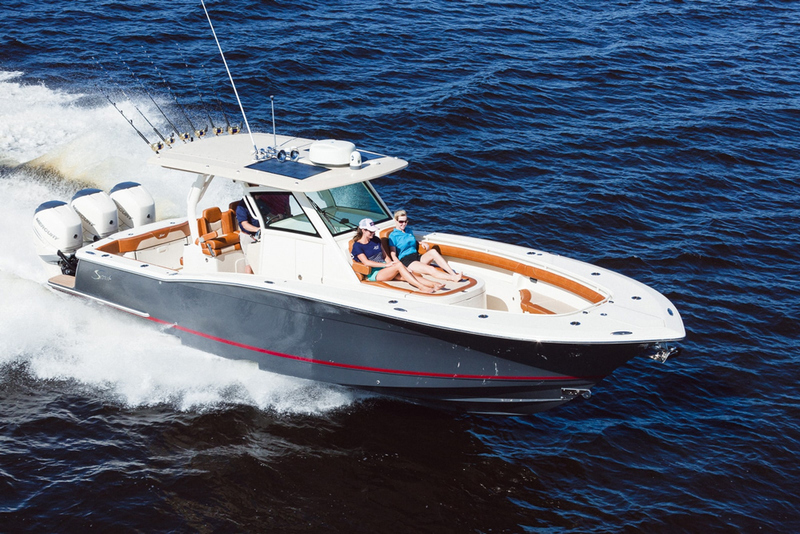 I stepped aboard the Scout 320 LXF at the Ft. Lauderdale Boat Show, and from the second my Topsiders hit the teak to the time I reached the bow’s peak, my head was swimming with “why didn’t I think of that” moments. 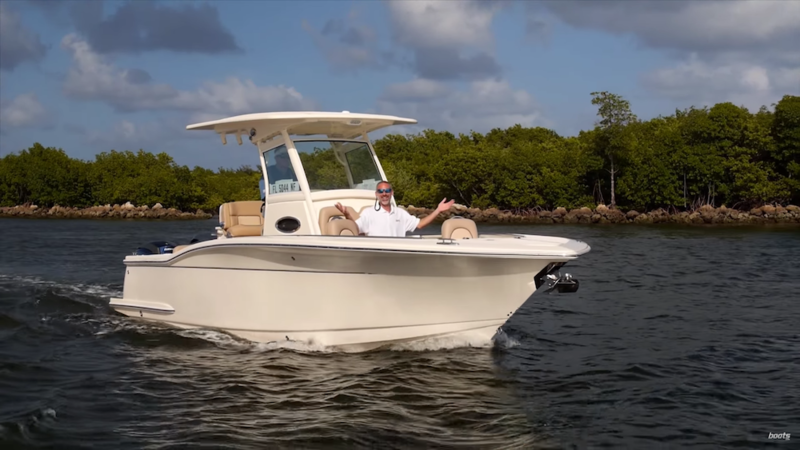 Scout is known as a regular innovator in the industry, and this latest model is a prime example of why: multiple design tweaks ranging from unusual to unheard-of take 32 feet of center console platform and expand its usability in ways no one has thought of to date. 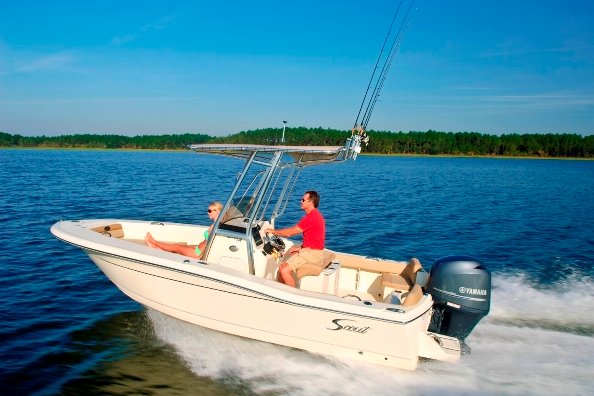 When you check out the Scout 320 LXF, get ready to ask: "Why didn't I think of that?" The first thing to catch my eye was the lack of a built-in electric grill behind the leaning post. Every self-respecting jumbo-console offers one these days, and they’re a great perk for families winding down after a day of casual fishing. But they come at a cost, since they’re almost always located in the back of the leaning post—where blood-and-guts fishboats opt for rigging and tackle stations. And since Scout markets the 320 LXF as a “luxury sportfisherman,” you’d certainly expect to see the trade-off made in this case. 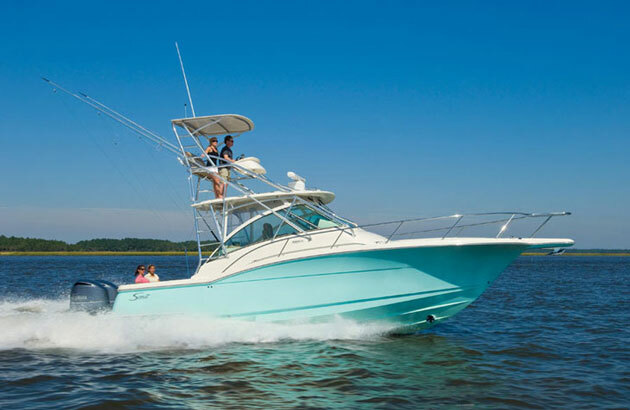 Instead of allowing the sacrifice, however, Scout came up with an inventive way to fit in a grill without cost to fishability: they molded a bump-out unit that fits into the bow, just aft of the seats. It’s trim enough and far enough forward that there’s still plenty of pass-through space, and there’s still enough room in front of it that four adults can sit in comfort, around a removable bow cockpit table if dining aboard is in the plans. 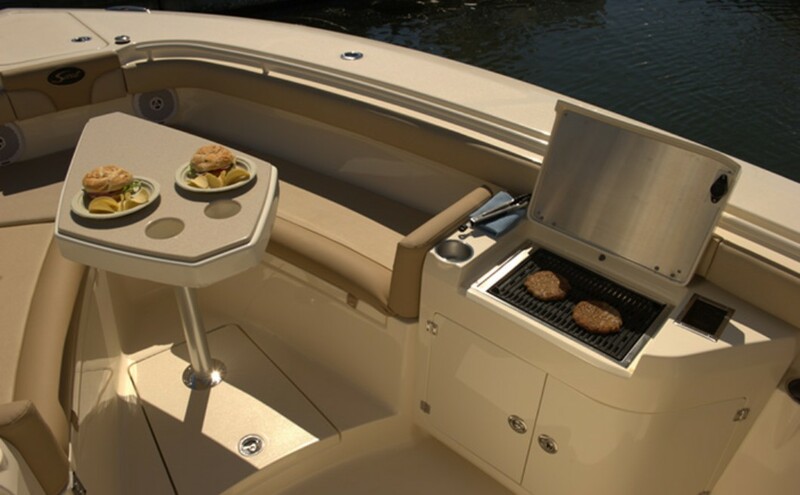 There’s extra stowage space beneath the grill, and on the opposite side of the boat the bump-out unit houses a sink, drawers, and bulk stowage areas. Get a first-hand look for yourself by watching our Scout 320 LXF Short Take Video. Scout has found a new way to design in a built-in electric grill - without sacraficing space in the tackle station. I know we’re jumping around a bit here by going from the leaning post right up to the bow, but stick with me for a second—we can’t head back to the cockpit just yet. First, swing open the doors on those bump-out stowage compartments. 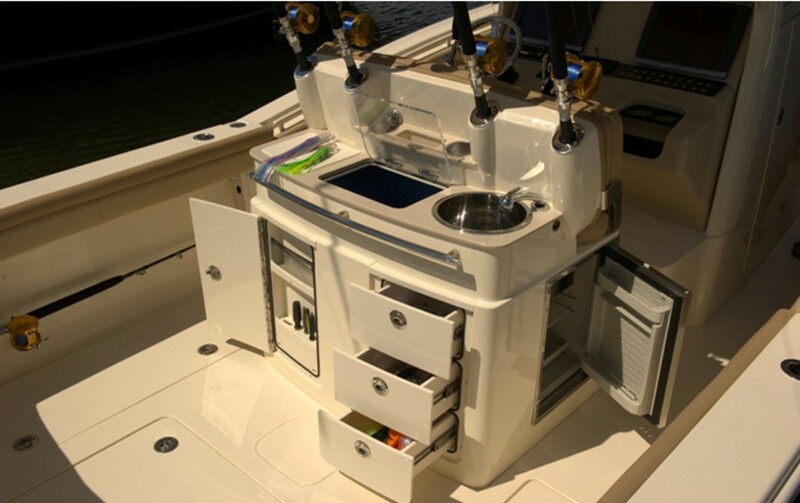 Note the perfect fit and finish on both sides and at the edges (and that the same is true of every hatch and door on the boat); the inside of the hatches are fitted with compression gaskets to keep water out; and the drawers slide open on buttery-smooth tracks that lock shut firmly when you slide them closed. You say you don’t care one iota for adornments like grills and sinks in the bow? No problem—since these units are modular, Scout can leave them off for you and the other savages. Okay: back to the spot the anglers care about, the cockpit. The transom seat folds flush to keep the cockpit unencumbered, and as you’ve probably surmised by this point, there’s a massive tackle and rigging station behind the leaning post. And I do mean massive. It has three big drawers, bulk stowage, rig/knife/pliers holders, a low-profile grab rail, a sink, a livewell, a refrigerator (optional), and four built-in rocket launchers. There’s also a huge bilge access hatch in the deck which makes it easy to get to the pumps and seacocks. If I had my druthers I’d slim down the access and enlarge the fishboxes to either side, which are big but (ahem) not quite big enough to chill down some of the fish I (like to think I might) catch now and again. 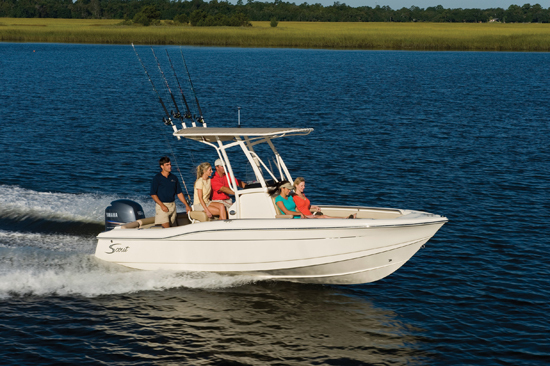 Others may feel differently, especially since there is additional fish stowage up front under the bow seats. The cockpit tackle station has room - lots of room - for everything from live baits to lures. At the helm—all around it, actually—you’ll find another trademark of Scout’s innovation. The hard top, window frames, and powder-coated supports are curved to match the tempered glass windshield and side windows, so they appear as though they are one solid structure. It looks good and more importantly, it’s shockingly strong. Just grab the back of the T-top, pull your feet off the deck and swing there for a while like I did, and you’ll know what I mean. Extra bonus: that top has molded-in spreader lights and stereo speakers. How will you like running the boat from inside that enclosure? You’re going to have to kick back against the leaning post and feel how it fits your body, for yourself. But there’s no doubt you’ll find the electronics flat pleasing, since it has room for a pair of whopping-big MFDs plus molded-in raised surfaces for the wheel, throttles, cup holder/stowage, and switch panel. Down under that console, you’ll find a roomy compartment with plenty of perks. The evolution of center console compartments has been fast and furious the past couple of decades, thanks in part to the popularity of over-sized CC’s like this one, and thanks in part to creative design. And down here again, you can see why Scout is known for cooking up ideas that stick. Instead of just molding a simple bare berth or stowage compartment under the foredeck, they utilized this spot for rod stowage. A rack for five big rigs with protective tubes at the tips runs fore and aft. Naturally there’s also a head down here, plus a sink and vanity. 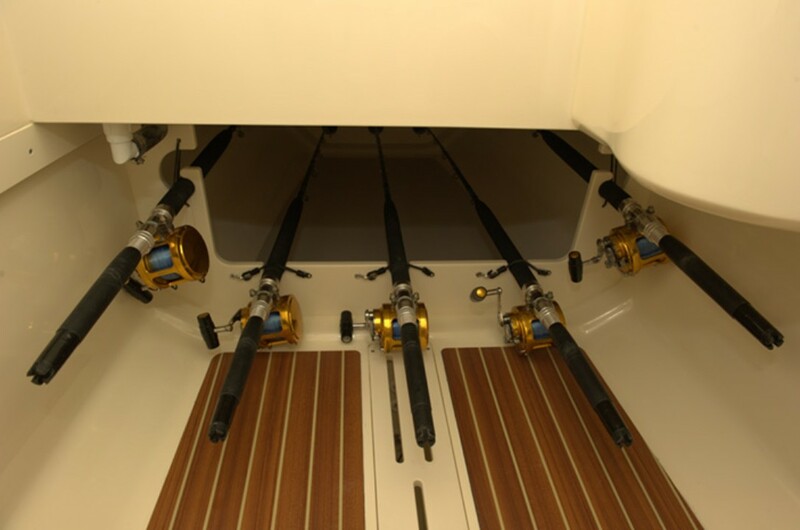 Your rods and reels will be just as comfortable as you are while the 320 LXF cruises to the fishing grounds. What’s the downside to building a big center console and loading it down with goodies? Size and weight mean a loss of speed and efficiency. Usually. I couldn’t run the Scout at the Lauderdale show (rats!) but Yamaha techs did just before the show—and in my experience, the performance numbers they gather are honest and reliable. They discovered that another of Scout's design tricks results in performance numbers that will raise your eyebrows. The 320 LXF runs on Scout’s NuV3 hull design, which mixes a convex hull form with a variable-degree deadrise that tapers to 23-degrees at the transom. I hate the name because it sounds gimmicky, but I love the results: With a pair of F-300’s on the transom—that’s 100 fewer horses than the capacity plate allows—this boat hit a top-end of 57.4-mph. Cruising speed at 4500 RPM is 40.7-mph, and if you cruise at a miserly 36.3-mph, you’ll get better than 1.5 miles to the gallon. Not bad, for 7,100 pounds of fiberglass. Not bad at all. 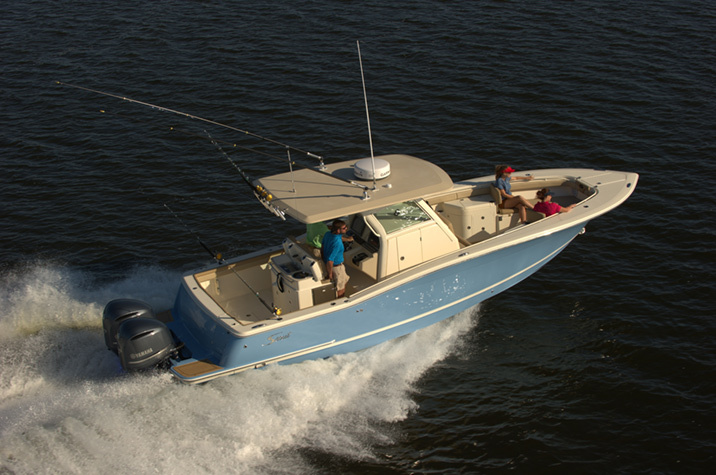 In fact, it's one of the aspects of the Scout 320 LXF that helped it make our list of the Top 10 Fishing Boats of 2012. 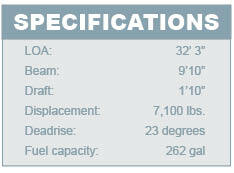 So, will the Scout 320 LXF be the ideal choice for you? That’s a question I can’t answer. 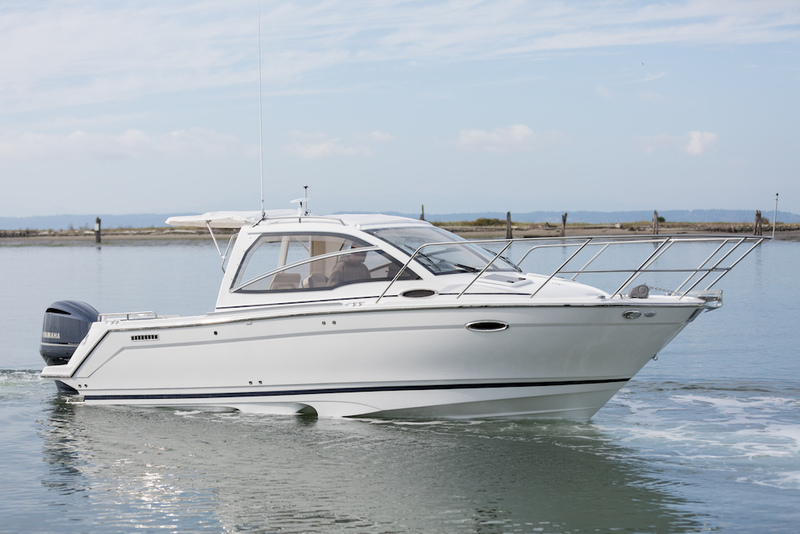 But one thing is for sure: if you appreciate innovative solutions that eliminate trade-offs in favor of having the best of both worlds, this boat is one you’ve got to see.